Quite typical of many wine regions in Spain, the winemakers of Rioja must feel the pull of their roots on the traditions of the past as well as the inevitable push towards the future. If the viticultural practices of the past have put Rioja on the map, it seems assimilation with current winemaking tactics and cleaner vinifications will help keep it there. 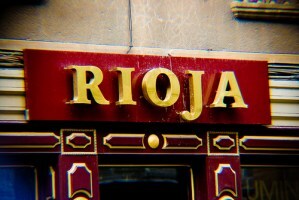 Rioja, located northeast of Madrid and south of the port city Bilbao, and with Basque and non-Basque influences, was the first (1991) appellation to be awarded Spain’s highest classification (DOCa). The region is divided into three sub regions: Rioja Alta, Rioja Alavesa and Rioja Baja. The main river of the region, the Ebro, runs from northwest to southeast and forms much of the border between the two best sub regions of Rioja Alavesa and Rioja Alta. The rocky peaks of the Sierra de Cantabria mountain chain block much of the harsh Atlantic wind and rain and form the northern border of the Rioja Alavesa. The reputation of the two superior sub regions comes largely from the fact that there are significant differences in temperature and soil from those of the Rioja Baja. Rioja Baja tends to be the hotter, drier region and harvest tends to occur earlier than in the Alta or Alavesa. Soils in all of the sub zones are varied with a large proportion of soft, crumbly red clay. The Alavesa tends to have the higher concentration of limestone and yellow alluvial deposits, followed by the Alta. Common practice in Rioja is to blend wines or grapes from all three sub zones in order to get a balanced wine: finesse and complexity from the Alta, structure from the Alavesa and body and alcohol from the Baja. Low, untrained bushvines tend to dominate the landscape of Rioja and red grapes make up nearly 80 percent of vineyard plantings. Of that, Tempranillo is indisputably the most dominant. Garnacha (Grenache) is second, followed by smaller plantings of Graciano and Mazuelo (Carignan). Viura (Macabeo) is the most prolific white grape but there are also limited amounts of Malvasia and Garnacha Blanca. 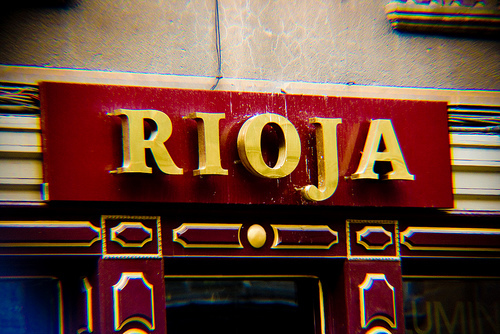 Traditionally, owing much to their French neighbors in Bordeaux, most Rioja was a blend of regions and grapes. What started out as an insurance policy against difficult weather and climate has become the signature style for both Bordeaux and Rioja. However, there are exceptions to the rule in Rioja. Single vineyard, single estate, and totally Tempranillo wines have all become fashionable in recent years. Rioja also inherited the Bordeaux barrique (barrica) during the late 1800’s as many of the Bordeaux winemakers were looking to other lands to offset the devastation of phylloxera. These barrels held about 225 liters and were much smaller and imparted more character than what was previously used. Another common practice in Rioja, certainly not even considered in Bordeaux, is the use of American oak. American oak typically imparts a stronger oak profile to the wine. The vanilla is sweeter, spices often stronger, and elements of coconut and dill can be found. Although many of the French tactics of blending, cooperage and elevage were incorporated, the conversion to Bordeaux varietals, thankfully, never fully transpired. Small amounts of Cabernet are grown in Rioja but most of it is still experimental and not widely practiced. As is to be expected in a region with the highest classification, many of the regulations involving the wines of Rioja are stricter than other regions. The aging requirements for Crianza, Reserva and Gran Reserva wines are the longest minimums in Spain. For red wines, a crianza is not released until the third year with at least one year in oak. Reservas are released in their fourth year with at least one year in oak. Gran Reservas, made only in exceptional years, are released in their sixth year with at least two years in oak. These mandatory minimums have recently had an effect not dissimilar to what spurred many of Tuscany’s finest wines to be declassified to Vino di Tavola (before the advent of the IGT category). Many Rioja winemakers choose to “downgrade” some of their best wines rather than cripple them with more oak than they deserve. With a region as large and diverse as Rioja, finding the best wines requires inspection into the practices, pedigree and integrity of the individual producer. Many of the best tend to be clustered around the bigger villages in the Rioja Alta and Rioja Alavesa. In the Alta, many of the great bodegas are located around the villages of Haro, Logrono, Cenicero, Briones and San Vicente. In the Alavesa, look to the villages of Labastida, Samaniego, Laguardia and Elciego. As noted earlier, aging designations on the bottle will give a good clue as to the style of the wine and which wines will best suit your palate or occasion. For early drinking and immediately accessible wines or something to enjoy with delicate fish, shellfish, light flavored tapas or cheeses, try a white, rose or red Joven-level Rioja. The white and rose wines work especially well as refreshing aperitifs in warmer weather. Their light body and lack of oak enable them to stand alone, without the aid of food. Crianza level wines will work with flavorful meats, stews, roasts and stronger cheeses. These wines will usually cost slightly more than the Joven-level wines but will offer more power and complexity. For special occasions or the financially fortunate, treat yourself to a Reserva or Gran Reserva style. These wines are only made in the best of vintages and have already been bottle aged prior to release (current vintages are at least 4-6 years old). In these wines one would expect to find a high level of concentration and complexity. There will be substantial elements of sweet vanilla oak and other spice nuances from extended aging in French or often American oak. Most producers source their best vineyards and vines for these wines-minerality and terroir become apparent through the older vines and lower yields. The Reserva and Gran Reserva wines are what has given Rioja the DOCa classification-the lower levels have financed their production. With all the different combinations of color, cost and style, Rioja remains one of the most dynamic and promising regions of Spain and holds its own among the wines of the world.